Super volcanoes is a term that has come into recent use. Supervolcano eruptions are those rare events when more than 1000 cubic kilometers (240 cubic miles) of pyroclastic material are blown out of a volcano during one eruption. These devastating events rarely occur and a supervolcano eruption has not occurred in recorded history. Supervolcano eruptions and mega calderas are produced by only a few volcanoes. These volcanoes are found worldwide and cover huge areas with lava and volcanic ash. Ash blown high into the atmosphere during an eruption cause sunlight to be blocked for several years. The Earth's atmospheric temperature is lowered when the sunlight is blocked from reaching the surface of the Earth. These changes in the atmosphere sometimes trigger mini-ice ages. The United States has had many supervolcano eruptions in prehistoric times. The largest of these eruptions produced La Garita Caldera in Colorado. It is estimated the eruption produced 5,000 cubic kilometers of pyroclastic material including ignimbrite. The last caldera eruption at Yellowstone has been estimated to be 1000 cubic kilometers in size. Lake Toba in North Sumatra, Indonesia is a mega caldera. It was produced by a supervolcano eruption before recorded history. Pyroclastic flows of hot ash and pumice covered 20,000 square kilometers of land with thick deposits of ignimbrite. 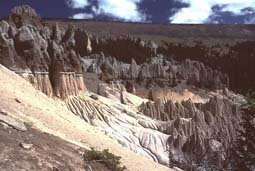 Ash and welded tuff deposits near the vent are 600 meters (2000 ft) thick. The ash spread out around the Earth covering the entire subcontinent of India with 6 inches of ash. Pyroclastic Flows Pyroclastic flows that travel down the sides of volcanoes at hurricane speed destroying every thing in their path. Dome Volcano Dome volcanoes form on the sides and in calderas of large stratovolcanoes. Super Volcanoes Super volcanoes that produce enormous amounts of ash and pyroclastic material during an eruption.